Well-known Bible stories with activities for younger children. A is for ark - God said there would be a terrible flood all over the earth because of man's sin. He told Noah how to build a huge ark or boat. All the people and animals who would go inside it would be safe. B is for basket - A little baby called Moses slept in a bulrush basket. It floated on the river, near the bank. His mother had hidden him there. She didn't want the wicked king to find him. C is for coat - When Joseph was a boy he wore a lovely coloured coat. No-one else had a coat quite like it. It was very special. His father gave it to him because he loved Joseph very much. This is the perfect compliment to the Banner of Truth book titled, A Bible Alphabet. This add-on activity book will engage your children as you read from A Bible Alphabet again and again, providing them with 26 large format tear-out sheets which young children will enjoy colouring, filling in the blanks, etc. 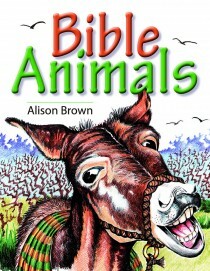 Bible Animals (for ages 5+) goes one step further; it uses a collection of animal stories drawn from Scripture, to present important, basic Bible truths. What is sin? Why did Jesus die? Why do bad things sometimes happen? Why is obedience important? These are issues about which positive God-honouring attitudes can be formed in the early years. Most young children, at some stage, are fascinated with numbers. They want to count each step as they climb the stairs or find out how many peas remain on their dinner plate. Much can be taught when a child's interest is aroused and much will be remembered when the learning involves fun. Bible Numbers, introduces a dozen Bible stories for the numbers 1-12, using large, colourful illustrations, and provides a corresponding colouring page for each. At the end of the book the stories are rearranged into an order through which the gospel message is presented. Very young children may simply enjoy the number associations while the more advanced can be taught the spiritual application. A verse relevant to each Bible truth is also suggested which may prove useful as a memory verse. When we pause to consider this wonderful earth, we see some incredible sights… a world full of beauty suspended in space, with billions of twinkling lights! Instead it was lovingly made by our God, whose power and great understanding are far beyond anything thought of by man; no problem was found too demanding. Many children have heard the stories of Abraham, Moses, Joshua, Daniel, etc., but are still unaware of the chronology of the Bible, or the important part each character played in God’s big plan for mankind. Using word-searches, jumbled sentences, number codes, and crosswords, these pages provide a journey through the Bible to help children see the ‘big picture’. While some reference has been made to every book of the Bible the emphasis on Genesis and the Gospels has been intentional since God’s Book is essentially a presentation of man’s need and God’s abundant answer through the person and work of his Son, the Lord Jesus Christ. The Bible is also God’s account of human history from the very beginning of time. Giving children a biblical worldview is foundational to developing their concept of an omnipotent God. They need to discover early that the answers to life’s most profound questions are to be found in God’s Amazing Book! many children today the Bible is a book for Sunday only. Some regard it as little more than a collection of stories which they fondly associate with Sunday School or their bedtime reading; easily discarded when they reach their teens, amid peer pressure to conform to the humanist and secularist views of today’s ‘real world’. We need to connect what children do in the classroom on the other days of the week to the Bible; turning often to its less familiar pages, until they see that in every area of our existence Scripture always has been, and still is, the supreme authority. Children learn through experience. We cannot expect them to trust God for eternity until they recognize the reliability of God’s account of what has happened in time.